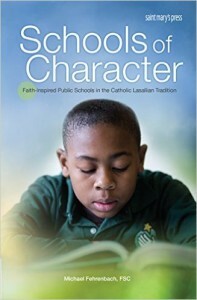 Brother Michael Fehrenbach, FSC, of the Midwest District, has released a new book, titled Schools of Character: Faith-Inspired Public Schools in the Catholic Lasallian Tradition. Brother Michael currently serves as liaison for Catholic and Lasallian schools at Lewis University in Romeoville, Illinois. He helped to design and implement the Catalyst schools, and until recently was the director of culture and values at those schools. The Catalyst schools are three public charter schools in Chicago established in the Lasallian tradition. This book explains how and why Catalyst schools came into being, and explores the roadmap they provide for others inspired to follow their lead.